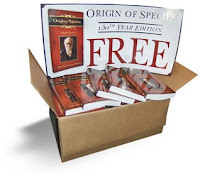 Atheists are fuming because 170,000 students across the country in America’s top 100 universities will be freely given a copy of Charles Darwin’s On the Origin of Species. Atheist forums are saying "Perhaps we should just call for a book burning! ", "In this instance, I would advocate book-burning. ", "I'm not into burning books, but this one deserves to be." Greg Laden wrote: "Start collecting those bogus-ized copies of Darwin's Origin being distributed by Ray Comfort. We're low on firewood up at the cabin. It's not that I like burning books. But this is not burning books." Comfort, the author of the 50-page Introduction in Darwin’s famous book, said, “It would seem that atheists see themselves as the intellectual saviors of those who haven't the brainpower to think for themselves. It was Irish playwright and atheist, George Bernard Shaw, who rightly warned, ‘All censorships exist to prevent any one from challenging current conceptions and existing institutions.’” See http://www.livingwaters.com/origin/presskit “Press kit” for textual, audio, and video sound bites.